Our route in pink. 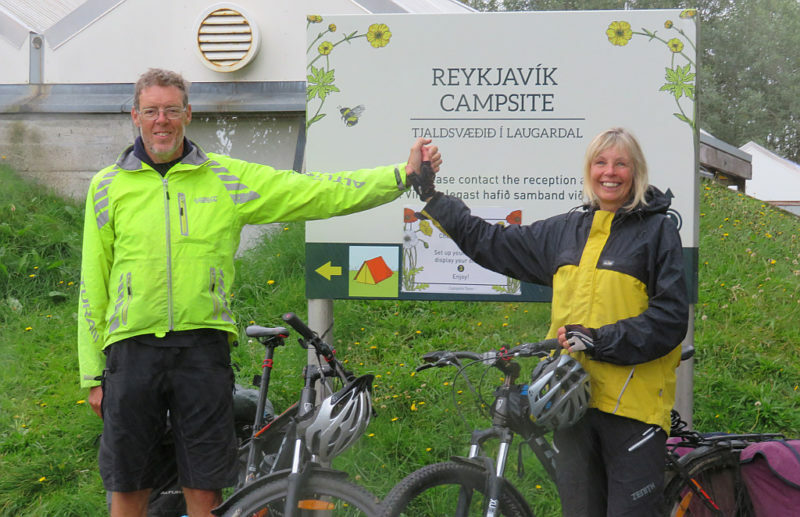 We went anti-clockwise, up through the middle first then through the Westfjords and back via the Southwest Peninsular – a total of 872 miles. 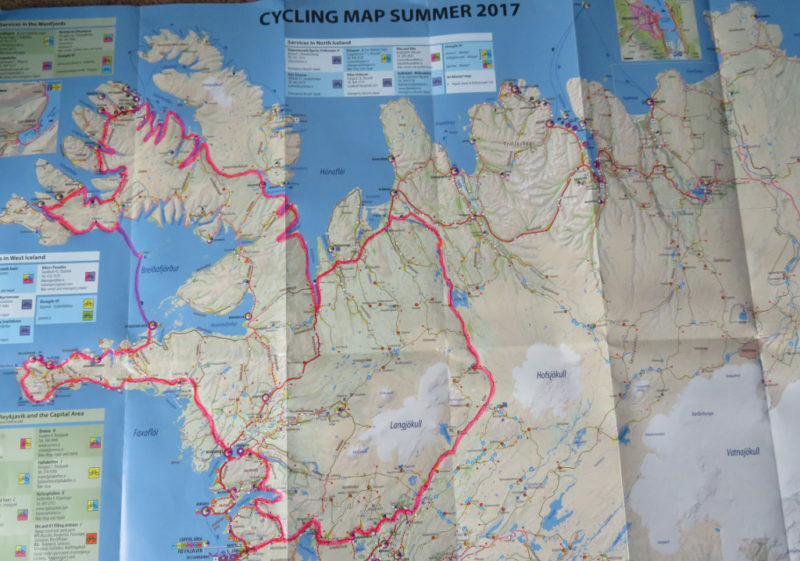 This is the new Iceland Cycling map that the majority of cyclists we met relied on and which shows shops (there are only a few), cafes as well as campsites and cycle enthusiasts who will help with broken bikes. We also had more detailed maps with us. After smuggling 8kg of food each into the country (you are allowed 3kg and we did go through the red channel at the airport but were luckily waved through), we collected our hire bikes which would be our companions for the next 20 days. On first inspection they looked bad, on closer inspection they were worse. I ended up with a mountain bike the same size as Tim’s after rejecting mine (no brakes or suspension). 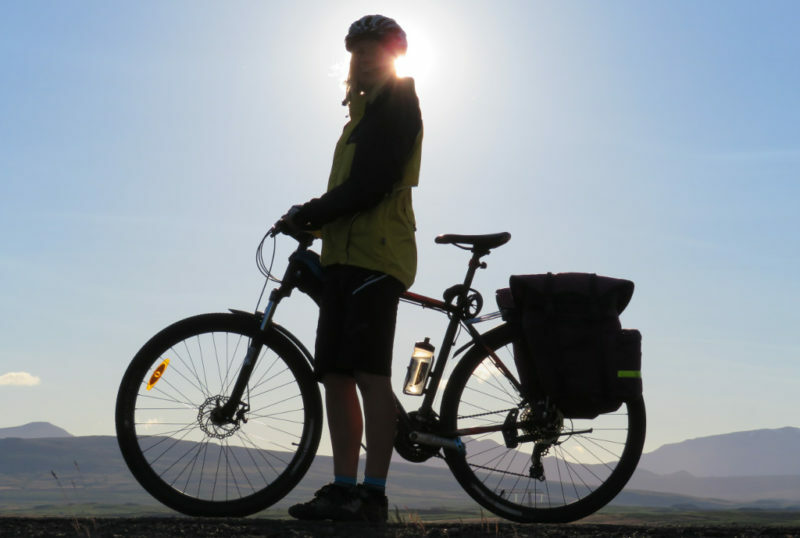 We loaded our panniers onto the racks (carrying 20kg each) and after a lot of good lucks, hand shaking and waving, set off on our epic trip…. Only to return half an hour later because Tim’s chain was slipping so badly he couldn’t continue. A quick gear cassette change and we set off again – far less dramatically this time with smiles more of a “hope we don’t see you again too soon” type. 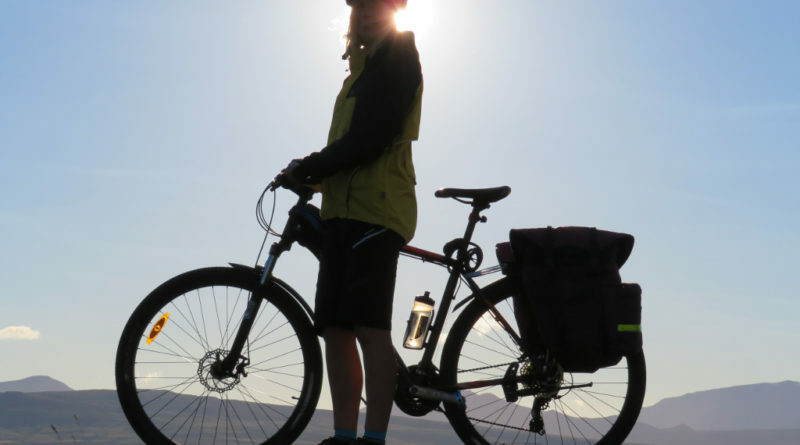 To be honest I could hardly move the massive mountain bike with more food on the back than I would normally get in a shopping trolley but I was excited and optimistic and the scenery was already stunning. 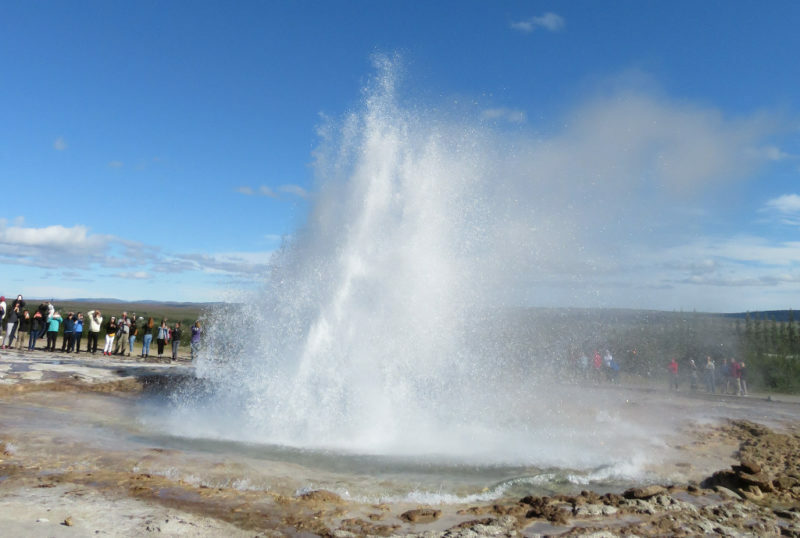 We did the touristy bit – the old Parliament, watched water spurting from the ground at Geysir and the massive Gullfoss waterfall. We then turned North onto the gravel road across the middle. The wind hit with such a force I was soon forced off my bike and began pushing up the rutted stoney road over the highlands. I have never experienced such a wind and Tim would often drop his bike and come back to help me push my huge load up the mountain. A fellow cyclist coming the other way stopped (just, as the wind was pushing him from behind at speed) and I gave as cheery hello as I could in the circumstances. He pulled his neck warmer down from over his face and growled – “road gets worse, winds much worse, good luck to you”. Pulled up his woolly neck warmer and cycled off. Thanks for that whoever you were!! It took four days to get through the barren, moon-like landscape of the centre. The road was pretty bad for about half and then improved. I was keen to eat the food quickly to lighten the panniers but we had our rations. Our days food consisted of Muesli with water for breakfast, 5 oatcakes with cheese from a tube or a tin of fish followed by a sesame seed bar for lunch and pasta, noodles or a dried meal for dinner with a couple of digestive biscuits. We also had 12 sweets each per day and a slab of cake whenever we were lucky enough to find a cafe. During our ride across the middle we decided on a 10 mile detour to a campsite nestling in the highlands and nearer the enormous glacier we were passing. There was also a natural geothermal bath which we enjoyed (although getting changed was a bit tricky and cold after because we each had a towel the size of a face cloth to save weight, which covered nothing!!). Bursting out from the centre back onto tarmac was amazing – lush green valleys, buildings and animals (sheep and horses mainly). 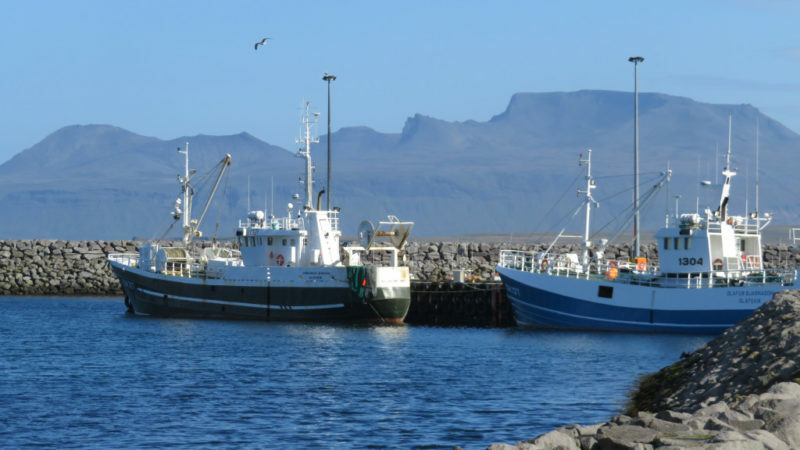 We continued to make our way along the coast towards Isafjordur – the largest town in the Westfjords. 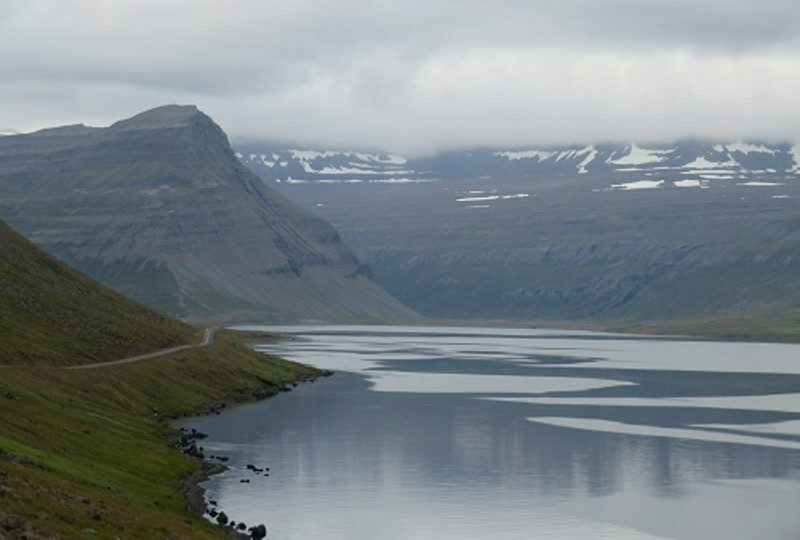 The road went in and out of the huge fjords – sometimes 20 miles in, across the bottom and then 20 miles out again. It was a few hundred km of this but the scenery was stunning, the sun mostly shone and our bikes were getting lighter! 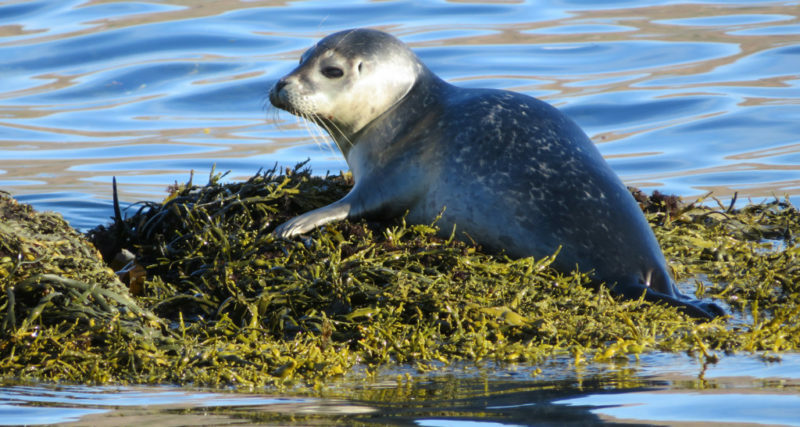 One night, wild camping, a baby seal swam back and forth watching us – it’s head straining out of the water for a better view. It was easy to wild camp with plenty of fresh water everywhere. 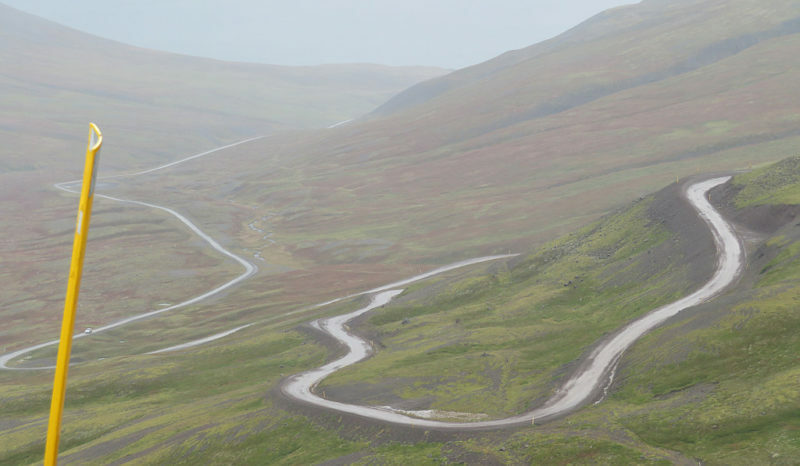 We often cycled 70 miles a day on these lovely roads. 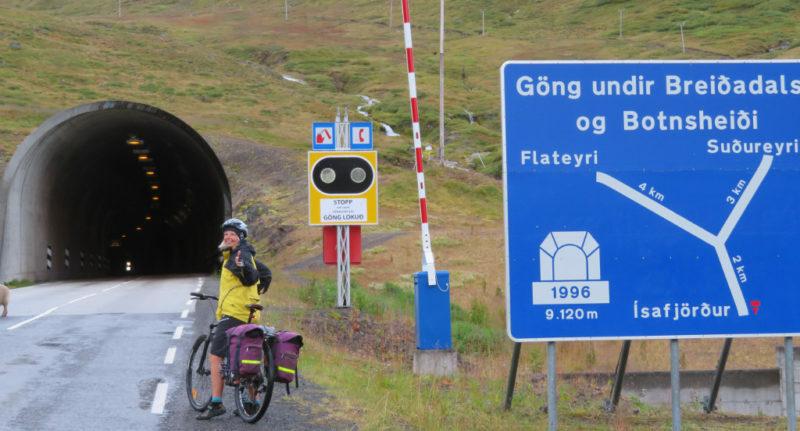 A 6km tunnel awaited us after Isafjordur and I was nervous about going through. It was an odd tunnel with a junction in the middle and one half single file and I woke Tim up early so we could go through before the few cars we saw each day arrived. We were on the road by 7.30 but it was fine – big and airy there was no fumes and plenty of passing spaces along the single file section. On the other side, although it mostly rained, we enjoyed cycling in the mountains and even found a couple of cafes. In one we treated ourselves to a much needed burger – the most delicious burger I’ve ever tasted!! Little did we know what was to come next…. 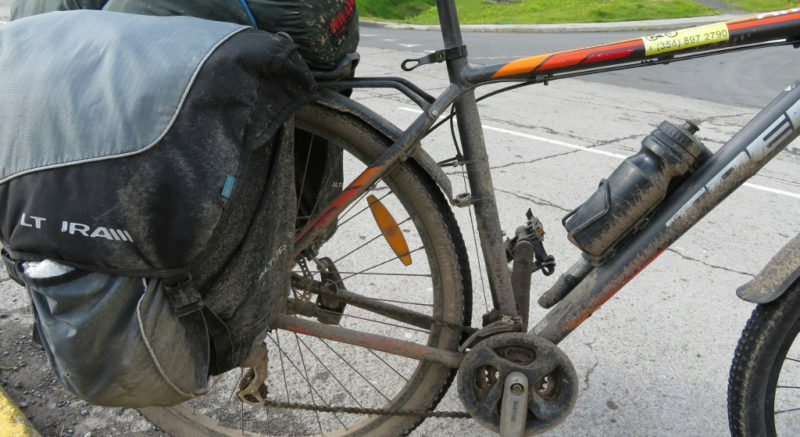 We set off midday over the next mountain pass only to find that for some mad reason, mud had been put along the road – it was something to do with the road being too stoney. We were soon covered – literally. Our bikes didn’t enjoy the gritty mud either and soon began to play up until Tim’s stopped changing gear altogether and we found ourselves pushing uphill for miles. Going down the other side was hair-raising with mud flying at us and non existent brakes. It was very windy and cold and at the bottom Tim looked blue and was shivering non stop. At this point a miracle happened – a small cafe appeared and was open despite being 5.15 in the evening. We rushed in and Tim took a seat near a heater to try and warm up. The lady was so lovely and said we could stay till 6 and then camp in a field nearby. We were so grateful and ate huge slabs of delicious oat and jam cake with many mugs of tea, but it was still a long time before Tim began to warm up. The next day the wind was better but we only managed 18 miles before getting completely soaked again and decided to do the next mountain pass the following day after some rest. We washed the bikes and our jackets the best we could and camped by a very impressive waterfall. And so the trip continued. The roads got better and we got through the mountains visiting some gorgeous little towns along the way. 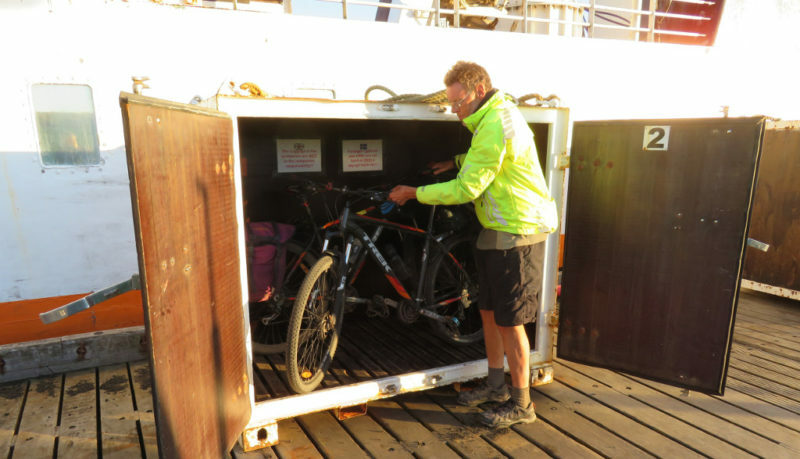 We then took a ferry to Flatey Island which was interesting as no cars were allowed on the island- so to enable us to take our bikes off the ferry, they were put in a larger container and hoisted on and off the ferry by a small crane. The island was only 2km long but we camped there and enjoyed walking round the following morning. Back on the mainland we had one final section of the expedition to go – around the southwest peninsula. 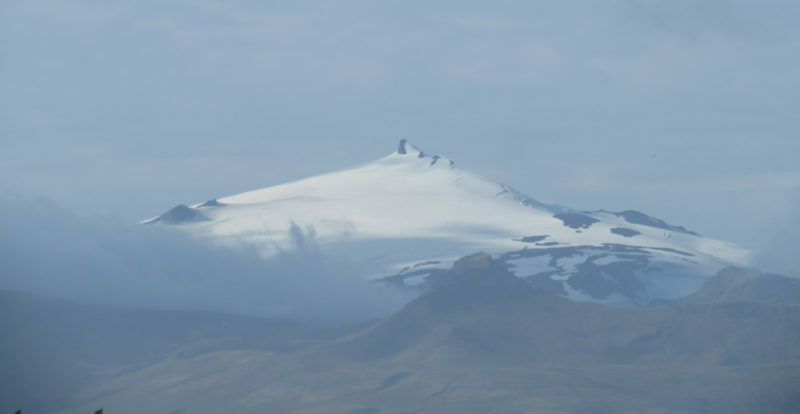 We cycled past the most photographed mountain in Iceland (Kirkjufell) due to its church like shape and continued to a campsite where we spent a night being battered by heavy and gusty winds. 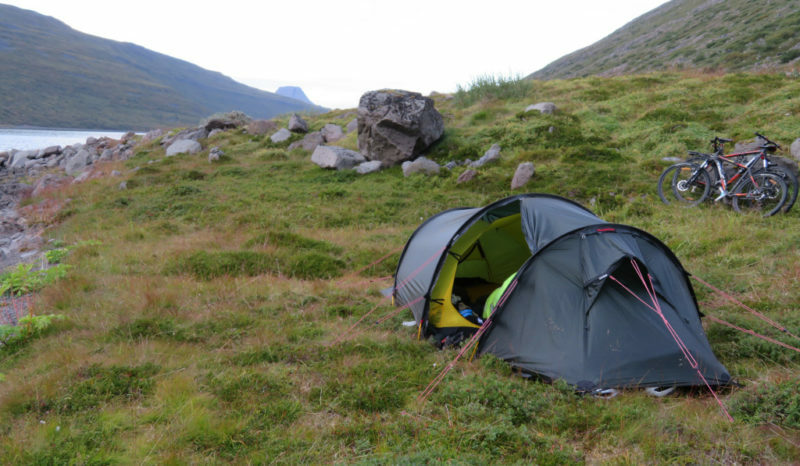 Our investment of a really good tent had paid off and in the morning other tents had been flattened. We knew we were in for a hard days cycling. Over the next couple of days we battled against 50mph head winds – only achieving 5mph even on the flat. It was really hard work and we were both exhausted. We were cycling around another Glacier and it seemed to take forever. Finally we were heading south again, across some more back roads to avoid the busy Route 1 and into Reykavik in time to return the bikes and head for the airport. Our food had worked out and we had been lucky with the bikes. 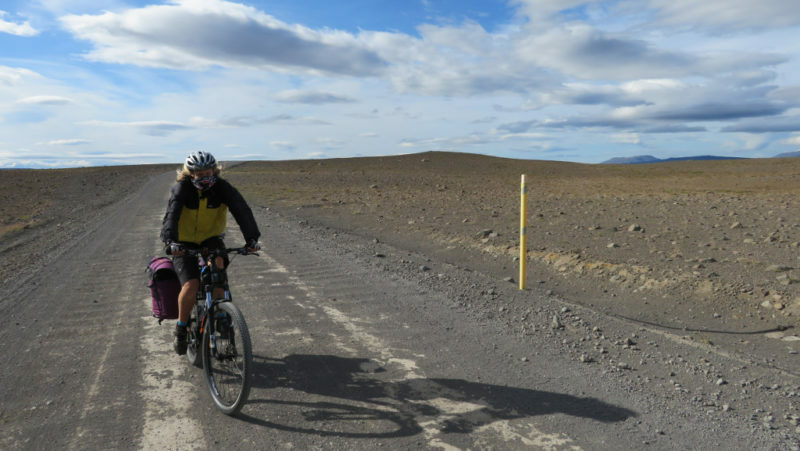 We had achieved the 872 mile route we had planned and, despite Iceland being one of the most expensive places we’ve ever been to – cycling there is an experience not to be missed.